Reports from the Llanfrechfa Grange Hospital of ghostly “hands of ice” would be enough to unnerve most patients - especially if you had just given birth! It is no longer a maternity hospital, but a former patient describes the “whole, unpleasant experience” in Ghosts of Gwent by Alan Roderick. 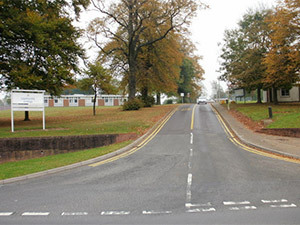 Pictured left is the entrance to Llanfrechfa Grange Hospital courtesy of Jaggery. Llanfrechfa is a village in Torfaen, Wales. It is situated on the outskirts of Cwmbran. Pictured left is All Saints Church, Llanfrechfa courtesy of Jennifer Luther Thomas. Licensed under CC BY-SA 3.0 via Wikimedia Commons.